Use it to enhance the audio output of any Cocoa or Carbon application on your Mac. From internet streams to Live Input to sound bytes off DVDs, Audio Hijack can capture and save any audio for you, in real-time. Take internet streams with you to work, or save them for relistening. You decide when you want to listen. When you record, there’s no need to stop all other audio output while recording from one source. That’s because unlike other recording products, Audio Hijack grabs audio from one source at a time, instead of the entire system. Your recording won’t have system alerts, iChat beeps, or any other audio you don’t want. Audio Hijack records exactly what you want to hear and nothing you don’t. 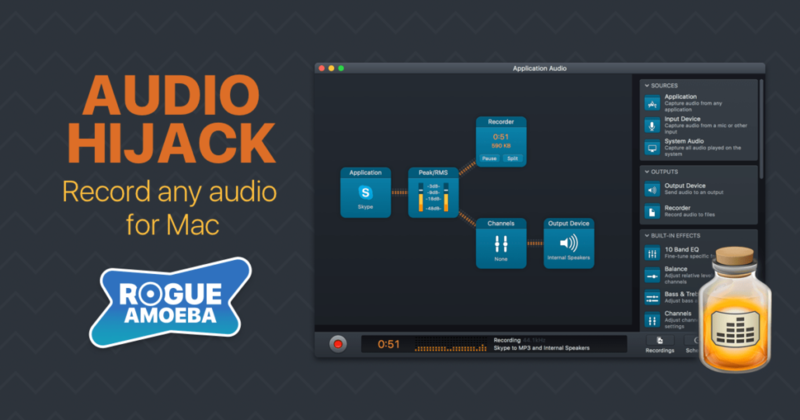 With Audio Hijack, you can add an Equalizer to any application which doesn’t have one. DVD Player, RealOne Player and Windows Media Player all benefit from an added equalizer. Many users even prefer our equalizer to the one built in to iTunes. The brand new Inspector window is a convenient tool for editing presets – its 4 tabs provide quick access to all the settings for a preset. Once you get it configured, you just need to use the controls on the Audio Hijack toolbar to activate a preset. Improved Sound Quality? Yeah, We’ve Got That. Tweak even low-quality Real and Windows Media audio files to perfection with our professional-quality Equalizer and the built-in Excitifier knob. Audio Hijack includes several powerful audio effects for refining the sound quality of any audio. Whadda I Have To Do To Wake You Up? With Audio Hijack and it’s built-in timers, you can turn any application in to an Alarm Clock. Just target an application and provide it an optional file, then set the time. Wake up to anything you want, from the morning news to the loudest heavy metal. Extend Audio Hijack’s functionality with add-on AppleScripts for post-processing. Included scripts allow for MP3 and AAC recording, via iTunes, and you can create more with ease. You can also target AppleScripts for hijacking.